206 pages | 86 B/W Illus. The semiotic perspective of Human-Computer Interaction (HCI) can give you insight into values, beliefs, and reference systems of the users that often go unnoticed when using traditional HCI approaches. Cross-Cultural Human-Computer Interaction and User Experience Design: A Semiotic Perspective focuses on the semiotic approach in product, services, and system design, and emphasizes the semiotic and linguistic aspects in HCI and user experience (UX). The book shows you how to leverage these insights when creating useful, usable, and appealing user interfaces. The book covers the theoretical background of HCI semiotics with emphasis on the interaction elements present in the user interface, the methodology to work with them to achieve useful insights both for design and evaluation, and the results obtained compared to traditional UX methods. It then examines a cross-cultural study presenting a semiotic method for design and evaluation in a different cultural background, and discusses the resulting insights, which are then structured as guidelines for HCI/UX design for Chinese users. Although extensive research has been done in HCI semiotics and the cultural aspects of HCI, this book differs by exploring how these fields are informed by the linguistic perspective. It presents a novel approach to cross-cultural HCI/UX, covers the latest research in the field, and brings a set of tools and methods to benefit the design process by taking a semiotic perspective. It also supplies a set of design guidelines for developing more usable, useful, and appealing products, services, and systems. 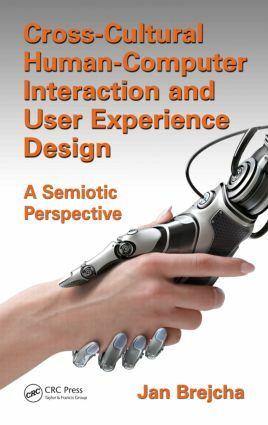 "Jan Brejcha has captured succinctly and eloquently the essentials of semiotics and of user-experience, and shown how to combine them in a manner that helps readers significantly to describe, analyze, evaluate, and design cross-cultural interaction and user experiencs. … usable, useful, and appealing content that is effective, easy to understand, and easy to apply." "… a practical book … includes useful examples and illustrations of how semiotic concepts can be appropriated by HCI professionals and, in this way, contribute to improve and expand the design of the users’ experience." "… focuses on one of the most interesting challenges in HCI research: cross-cultural HCI design and user experience. … responds to the demand for thinking in users as active consumers, which lives in a changing world." "One of the strengths of the material that I reviewed is that it is based on a sound rationale and it accurately reviews relevant literature. Additionally, it is based on sound and appropriate research design. … The author not only provides a set of tools and methods to benefit the design process in UIs, but also presents implications for theory development and/or practice in this field. "A lot of efforts have been made in HCI to understand the phenomenon and to develop methods for practice. This book tackles the issue by taking user interface as a language or linguistic phenomenon and attempt to develop an approach for user interface design and evaluation based on semiotics theory. It provides a theoretic foundation and some case studies for the approach which is practically helpful for researchers and practitioners who want pursue cross-cultural HCI." "This book is a good read for experienced UX researchers and interaction designers who are developing systems and applications for users from different cultural backgrounds. Much has been written about cross-cultural UX, highlighting the increasing attention and importance it has experienced in recent years. However, it is not something that UX researchers need to study comprehensively in order to get it right; once you have read this book, you will have a good starting point." Jan Brejcha obtained his Ph.D. in Interaction and Communication Design from a semiotic perspective at the New Media Studies, Institute of Information Studies and Librarianship, Charles University in Prague, Czech Republic. As part of his doctoral thesis, he developed a semiotics and language-based design, analysis, and evaluation methodology. He is a lecturer at Charles University and a consultant for many HCI-related projects in the academic and corporate field. He is an accomplished author and has expertise in user-centered and semiotic design and analysis techniques, as well as a solid background in machine tools, small-business administration and marketing. He earned his master's degree in Media and Communication studies from the Electronic Culture and Semiotics department at Charles University, where he completed his graduate thesis "Between Code and Design: Towards a philosophy of interaction design".